It looks like AMD is working on more Ryzen APUs than they have officially confirmed. As revealed in a new leak by Videocardz, AMD Ryzen APUs will soon be getting low power parts which will run at a rated TDP of just 35W. The low power AMD Ryzen APUs have lots of similarities in terms of architecture and platform support to their full fledged brothers. First of all, these low power APUs feature the same Zen processor architecture and the Vega graphics architecture. 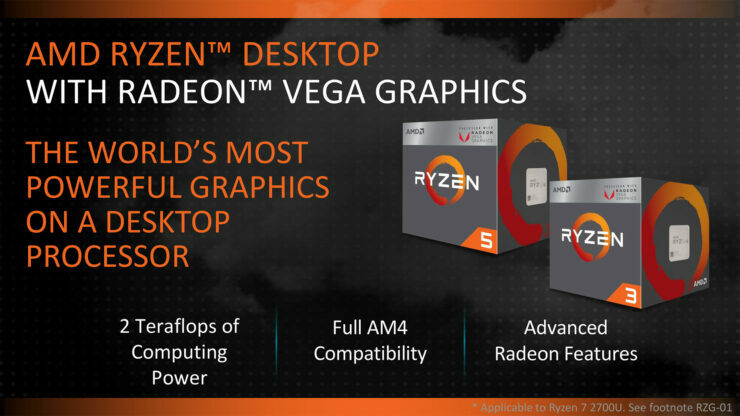 These APUs will be supported by the AM4 desktop platform and will come with all the features that the upcoming Ryzen APUs will deliver to users. Now coming to the part where these APUs start getting different than the 65W TDP parts. The TDP of these chips is rated at 35W, this is part of the low-power design which these chips are targeting. Next up, the low power APUs do have a slight drawback when it comes to clock speeds. I mean, it’s a given that these APUs will not operate at the same speeds as the 65W parts due to power constraints and hence, clock speeds on both CPU and GPU side will be slower. We are talking about a 300-400 MHz difference here. Coming to the specifications, the AMD Ryzen 5 2400GE will feature four cores and eight threads. Clock speeds will be maintained at 3.2 GHz base while the boost clock is currently unknown. The chip will house the Vega 11 graphics core with 704 stream processors but clock speeds of the gpu remain an unknown too. The Ryzen 3 2200GE on the other hand is a quad core and quad thread part with a base clock of 3.2 GHz and similarly, boost clocks and iGPU clocks are an unknown at the moment. We can expect slightly lower prices than the 65W parts on these APUs as they will come to be a very budget solution for HTPC and eSports PC builders. Expect the new APUs to be announced soon and as for the 65W parts, you can read their first performance impressions here.